Well the three ducklings have grown so quickly that they are almost too big to squeeze through the fence of the yard I put the gang in at night. They free range with their ‘minders’ all day. 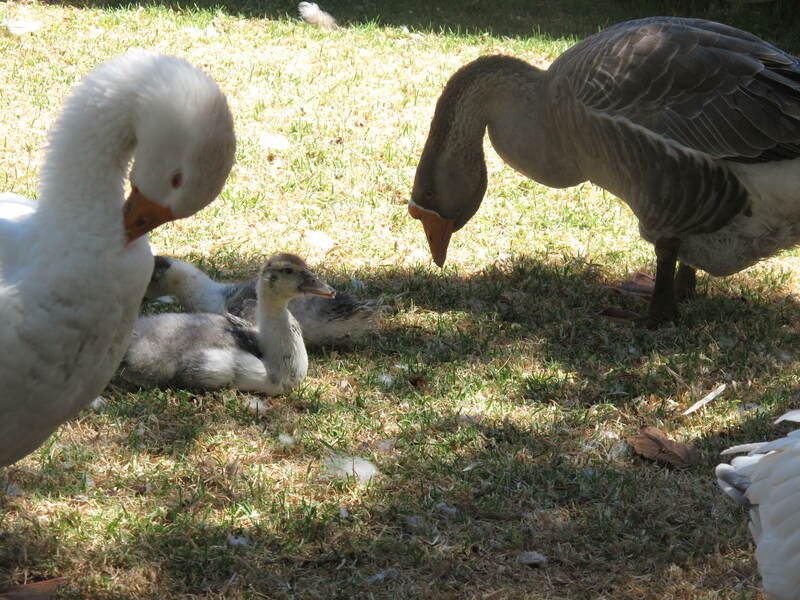 Here’s a picture of Seli and Godfrey guarding the Twins. 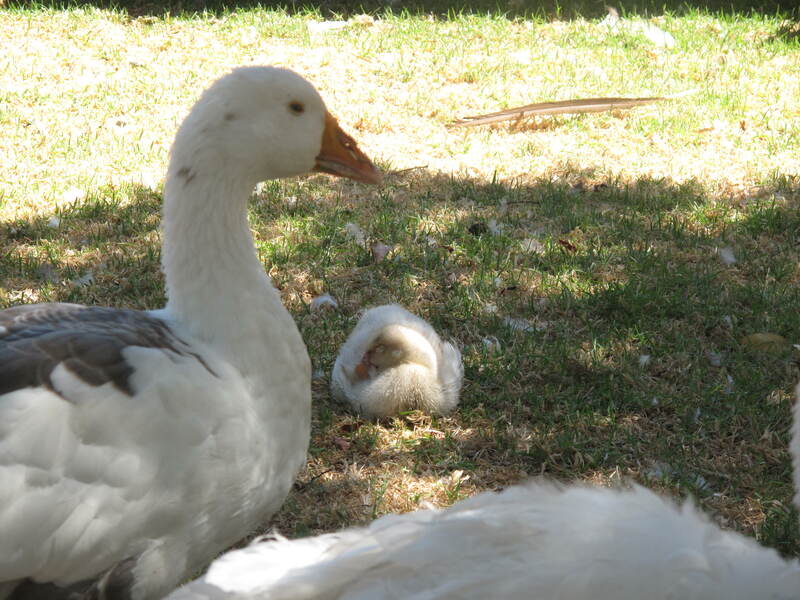 And here’s one of Ola watching over a sleeping Michael Jackson (the dancing duckling). I took a whole lot of better photos of all of them but had to delete these because Ming’s smashed ute (truck) was in the background. The gang + ducklings tend to hang out underneath it because it is near the pond. We have covered the smashed-in front of the ute with a blanket so that visitors, especially family, won’t be upset if they see it. The rest of the ute looks normal, with the tray intact. I wish we could get rid of it but we are stuck with it in the back yard for now until we try again to claim some insurance. Every morning and every evening, when I let the gang out, or put them into the yard, I have to walk past the ute. There is also a clear view of the ute from the kitchen window, a constant reminder of the accident and everything since. And when I frolic in the dirt, and offer prayers to the sky, and watch the pea-chicks climb the avocado tree, or cry until my body is cramped like a dead leaf, I am always right next to the ute. Ming brought Ants home for the afternoon yesterday and I (rather dramatically) threw myself into his chest and soaked him with some of these endless, futile, enormous tears. He held me and said nice things to me and then asked me about the ducklings. “When are we eating them?” he asked. When are we eating them? hahaha Oh man, I love his humour! Even funnier! Seriously though, he stopped you right in your tracks right? It’s bad luck to have to have such a reminder staring you in the face every day. You’ll have to train the duckings with breadcrumbs to lurk somewhere else. I have decided to stare that ute down. Clever way to get you to stop crying 😉 they’re all looking lovely. They got out again this morning argh! It’s not repairable unfortunately. Sterkte! Dont they payout a replacement value?? No, because he broke the law by having kids in back of ute. That’s a good word too! Your writing is so powerful today, Julie. And I loved Ants power to shift your crying to balking with his question about eating the ducks! Clever man. It’s not driveable so we would have to get the towing people back (they are the ones that put it in the back yard). I’ll just have to live with it for the time being. Ming is not affected by it thankfully. I meant the ducks of course Julie. And you have an avocado tree!!! I love Avocados. How can the insurance company get out of paying-up? It was an accident. Sods! Too bad I can’t send you a few avocados – they are nearly ripe. Yes, the insurance company situation is tricky. Anthony has a devil of a sense of humor 😉 He reminded me of my baby girl when she was little and would call the lobster we bought her friend and then she would ask when were we going to eat the lobster, she was hungry. I am sending you big hugs Jules, time is a healer I always hope. Your baby girl is such a character! Re Ants – I don’t think he was kidding! Yes, Ants has always had the ability to say the right thing at the right time, even now when he is so confused. Julie, your tears are neither endless, nor futile. To hold them back is unhealthy and they are washing away your sorrow. Grief, as you process that horrible accident – is normal. I guarantee you it will pass. The beauty of nature and wildlife is keeping you centered, as you also deal with the unbearable loss of Anthony and what his illness entails. It’s a lot! Your heartfelt writing will someday remind you of how you managed to survive such ordeals by pouring out your soul with beautiful words. I feel a bit embarrassed now about writing such a soppy post – I must pull myself together! Please don’t. You are already pulled in so many directions. You are quite together and emotions help you stay grounded! Luckily it is already in the back yard so at least when people come to the front door, it isn’t visible, but you know what it’s like on farms – people come to the back door! Haha – that’s a lot of love – thank you Louise!!! Eating the ducklings, the very idea! He wants to eat the peacocks too! They are growing fast! Always amazes me at the ponds here how fast they grow.Was Ants teasing you? Is the Ute a write-off or can it be repaired/replaced? Write-off unfortunately. Ants was being literal I think! 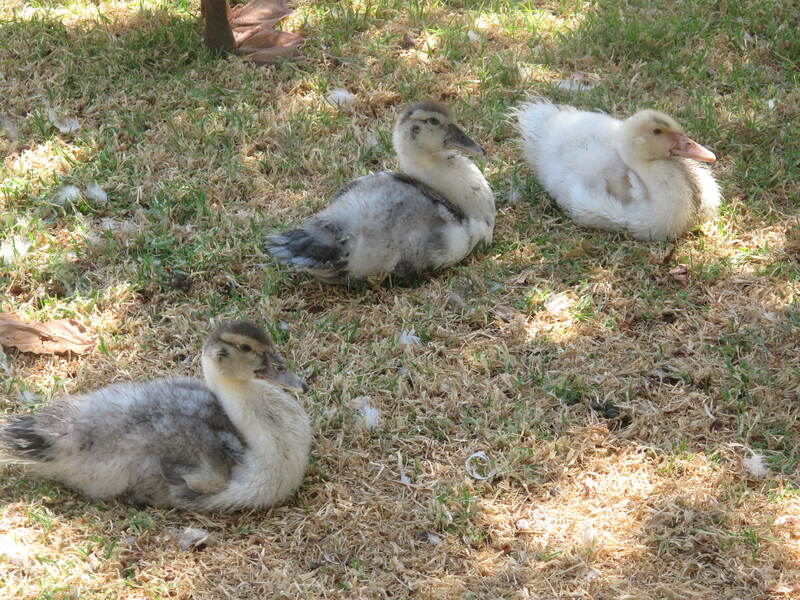 The ducklings sure are growing fast. They’re still so adorable! Peachicks are thriving too but impossible to get a good photo of because they blend into the background so well (which is probably why they are still alive and not taken by crows or foxes). Lovely chicks. If Ant eats them tell him I’ll come over and give him a ‘Glasgow Kiss’! I think it originally came from the Gorbals in Glasgow, which was a slum containing immigrants such as Irish Catholics, Italians and Jews. The slums are all away now and replaced by industrial estates and some houses. The ducklings look absolutely gorgeous. How could anyone possibly eat a pet? With a name? If I was raising animals for food, I definitely wouldn’t give them names – that would be too much for me. In fact, I don’t think I could be a farmer as I get too attached to things I see every day. I couldn’t raise animals to eat either. When a local farmer took my pigs, Mathilda and Vegemite, I was so relieved he was using them for breeding and not eating. Oh My God! I love Ants!!!!! He’s very good at one-liners! 🙂 BTW I don’t understand why not all your posts are getting into my email. Hmm.